Dr. Greg Powell has an exemplary and notable career of leadership and innovation that spans 40 years in the fields of emergency and aviation medicine, education and research. 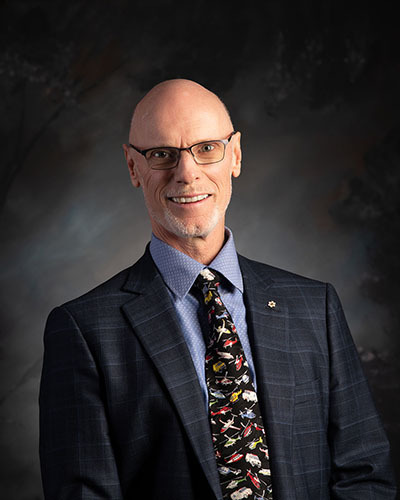 He is a Professor Emeritus, Emergency and Family Medicine, University of Calgary and is a founder of STARS (Shock Trauma Air Rescue Service) and the STARS Foundation. As a result, he has been extensively involved and networked in the philanthropic and business community in Alberta. He held the position of Chief Executive Officer , STARS & STARS Foundation until April 2012 and continues today in the role of Founder and Director Emeritus. Dr. Powell is an internationally recognized leader in critical patient care, air medical transportation and emergency medical training and education and has received many awards and significant recognition throughout his career. In 2006, he was appointed an Officer of the Order of Canada, in recognition of his contribution to the community and Canada. He was recently appointed to the Patient and Family Advisory Committee of the Health Quality Council of Alberta. Dr. Powell resides in the Calgary area with his wife Linda and they have three grown children. Personal hobbies include golfing and an avid interest in aviation, having attained his Fixed Wing Pilot License with a multi-engine IFR rating during his career. He is also a member of the North Hill Lions Club in Calgary, Alberta.